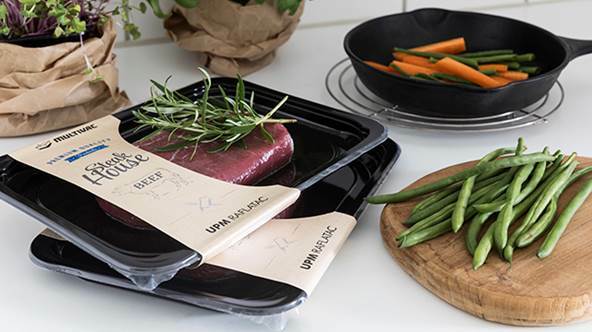 (UPM Raflatac, Helsinki, 25 September 2018 at 14:30 EET) - UPM Raflatac has been cooperating with MULTIVAC to develop full wrap solution with self-adhesive labels for food packaging. The solution will be presented during FachPack 2018 - the European trade fair for packaging, processing and technology taking place in Nuremberg, Germany, on September 25-27. With full wrap labeling a label encloses four sides of a pack, similar to a banderole. Thanks to this, full wrap labeling offers various possibilities in the design of the pack, and this in turn contributes significantly to increasing the attractiveness of these packs at the point of sale. Self-adhesive full wrap solutions open food products to the whole world of label shapes and materials and are ideal for several types of packs, including vacuum skin packs, thermoformed MAP packs as well as trays and clamshells in a wide variety of shapes and materials. All this improves the impression and gives more opportunities to differentiate your food product on the shelf. Why full wrap label makes a difference? Due to the labels being held in effect by the carrier material, they can be shaped to fit perfectly, e.g. with curves and cut-outs to specific food and package. This provides great flexibility with the shape and design of the label and maximizes product visibility as well as area for branding to gain superior position at the point of sale compared to linerless or a top label. Self-adhesive technology provides also increased efficiency of the labeling process. With fewer reel changes in comparison to usual linerless materials, they offer savings in downtime and start-up waste, lower packaging and transportation costs, and increased storage capacity for both raw materials and finished stock. Additionally, no manual application is needed. Either there is no specific investment needed for the printing as the solution is feasible with various printing houses. Full wrap with self-adhesive labels is a sustainable solution. Backing paper from full wrap can be recycled with UPM Raflatac's RafCycle® program and turned into new paper. Moreover UPM Raflatac's self-adhesive label materials for full wrap - called Raflacoat Board NXT+ FSC and Raflacoat NXT+ FSC - create a great opportunity to enhance sustainability by delivering incredible reductions in energy, water, and waste throughout their lifecycle compared to standard paper labels. The labeling solutions offered by MULTIVAC are tailored to the output and infrastructure requirements of customers. That way, individual needs define the complexity and functionality - a crucial factor for their sustainability. UPM Raflatac has wide range of self-adhesive materials combined with different adhesives suitable for full wrap labeling with different packages and circumstances. UPM Raflatac label materials have been tested on MULTIVAC's PSA (pressure sensitive adhesive) full wrap machinery to ensure efficient application with variety of possibilities. Learn more about the solution from the Guide to full wrap with self-adhesive labels. MULTIVAC is one of the world's leading suppliers of integrated packaging solutions with a focus on packaging, processing, portioning, labelling and marking, inspection and handling. As a technology partner, we offer a product portfolio, which is unique in the market - and every day we set a new benchmark as regards technology, efficiency and reliability. MULTIVAC's packaging systems are highly impressive in their output, durability, modularity and flexibility as well as their ease of operation and hygiene. Thanks to the guarantee of highest quality with all MULTIVAC products, we contribute significantly to a higher level of investment security and a reduction in the total cost of ownership for every company. Find out more at www.multivac.com.